Just 12 kilometers north-east of St Helens, Tasmania in the beautiful Bay of Fires, is the famous coastal resort of Binalong Bay. This was formerly just a retirement village, but has now become a very popular holiday venue for those people who enjoy surf and ocean fishing, diving, snorkelling, canoeing, bush walking and nature. It borders some of the best wilderness areas in the World, notably the Bay of Fires Coastal Reserve, and its adjacent lagoons. With its stunning blue waters, red rocks, white beaches and fishing lagoons, the Bay of Fires has something for everyone. This image belongs to the travel and nature stock photo library. This stock photo of Sunrise at Binalong Bay is available for licensing for commercial and editorial uses including websites, blogs, books, magazines, brochures and advertising. Restrictions may apply for images which contain third party copyrighted material or sensitive subjects. Photos of artwork are for editorial use only. 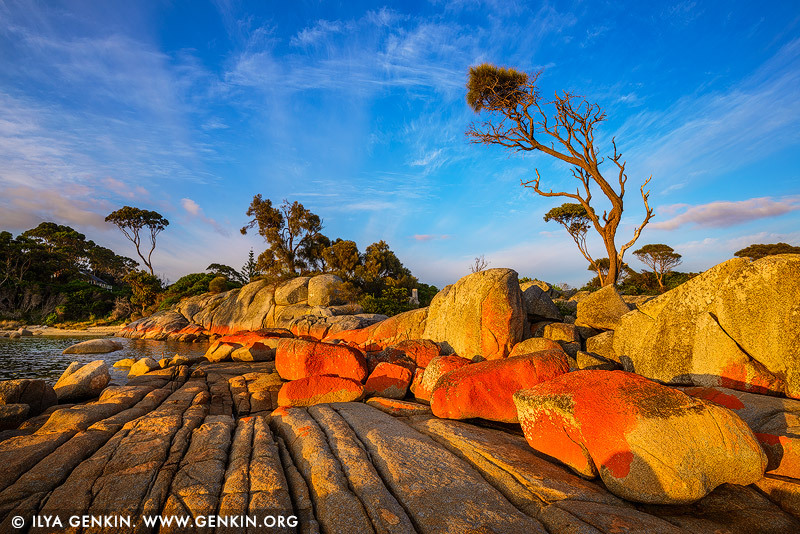 This image id TAS-BAY-OF-FIRES-0003 of Sunrise at Binalong Bay, is copyrighted © by Ilya Genkin. This is not a public domain image.